The North British Railway Class C, LNER class J36 was introduced by Matthew Holmes in 1888 and built in batches until the class numbered 168 by 1900. As built the locomotives were fitted with a round topped cab of Stirling design and followed a similar style to previous NBR 0-6-0 tender locomotives. Rebuilding of the locomotives began in 1913 and continued up until the grouping by which time eight locomotives remained unaltered. During the rebuilding the original boilers were replaced with a slightly larger one of 4’ 8 1/8” diameter, safety valves which had originally been on top of the dome were mounted on the firebox and a new cab with a single side window was fitted. The locomotives rebuilt during the Reid period (1913-1920) were fitted with laminated springs to the leading and driving axles and helical springs to the trailing axle. Locomotives rebuilt by Chalmers between 1921-1923 were fitted with laminated springs on all axles. All locomotives were subsequently altered to the Reid arrangement from 1923 onwards. The arrangement of brakes on these locomotives saw many changes during their lifetime with the first being fitted with steam brake only, to be followed by a batch with Westinghouse brake, and subsequently locomotives with both steam and Westinghouse brake. Changes were many and continued until Nationalisation, therefore reference should be made to the RCTS Green Book, Locomotives of the LNER Part 5, where you can peruse in detail the specific changes made and select the correct brake arrangement for your model. Tenders fitted to all locomotives were of the standard Holmes 2500 gallon type with 6ft. plus 6ft. wheelbase. The main alteration to these was the fitting of coal rails and latterly sheet metal coal guards. 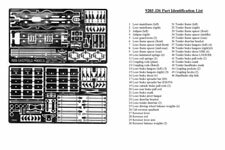 Please click the image to see an image of the etches and a list of parts. The kit includes brass bearings and various lengths of wire. 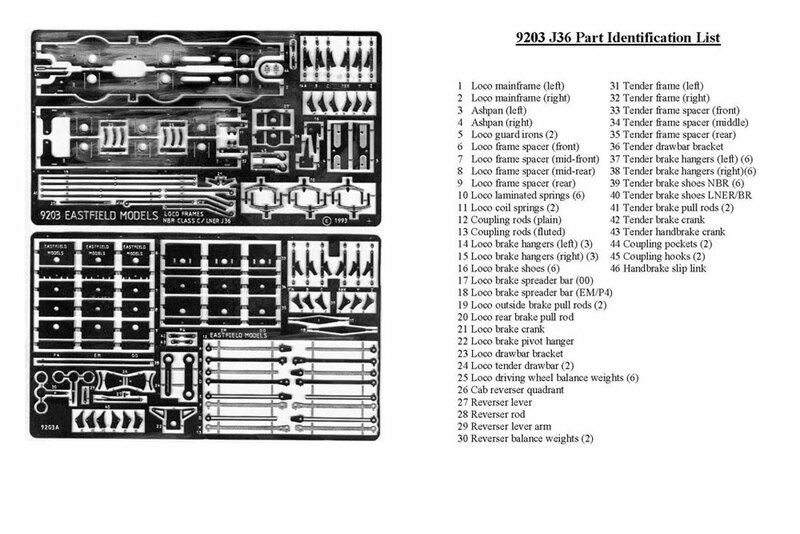 Read Max Stafford’s review of the J36 chassis kit on the RM Weblog .